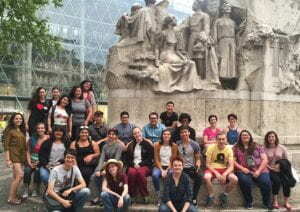 The Texas State Chamber Orchestra returned from a fabulous tour of Eastern Europe. 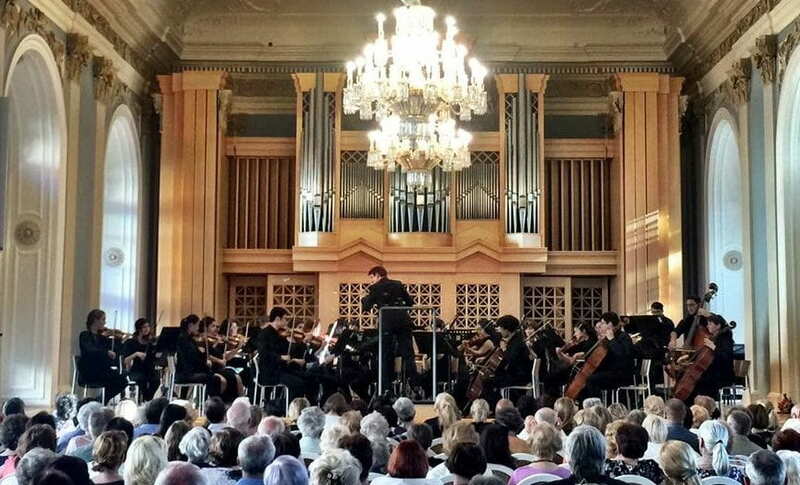 Led by director Carolyn Watson and faculty soloists Ames Asbell and Karla Hamelin, they performed in Budapest, Vienna, and Prague. Associate Dean Mary Ellen Cavitt helped lead the tour. 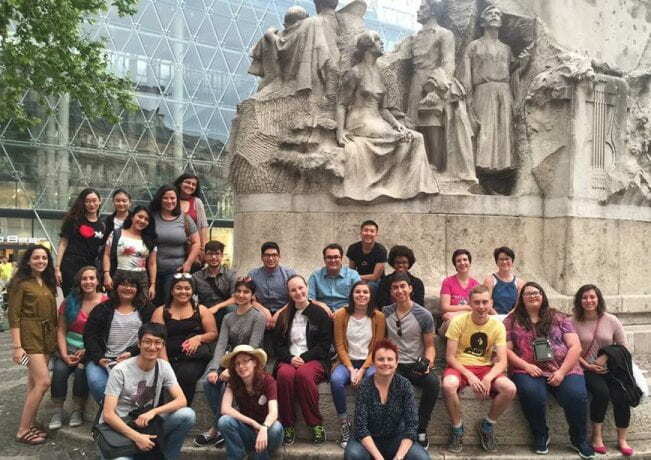 They also visited places such as Budapest’s Castle Hill and Heroes’ Square, Esterhazy Palace, Schönbrunn Palace, St. Stephen’s Cathedral, Prague Castle, St. Vitus Cathedral, and enjoyed a dinner cruise along the Vltava. Student players: Seattle Adams, Anne Archer, Kathleen Beavers, Teresa Bejar, Esteban Borjas, Terri Boutte, Shijun Chen, Vikas Chopra, Kimberly Cordon, Anna Cullnane, Emily Edwards, Nabile Galvan Garcia, Stephanie Garcia, Ziqing Guan, Cody Hoang, Arianna Jefferson, Daniel Keller, Bethany Lee, Jordan LePage, Jingyu Li, Julia Perez, Eric Puente, Oliver Richards, Hope Talton, Peter Thoeni, Connor Towns, Anna Trevino, Elizabeth Valvano, Gabriel Vazquez, Sarah Walters, Aaron Wells, Celeste Wilmot. This entry was posted in alumni students faculty NEWS and tagged chamber orchestra, TXST Orchestra on May 31, 2017 by Thomas S. Clark. 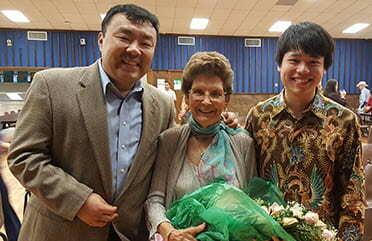 Donors with fond memories of Tilden piano teacher Betty Dickinson have funded a $260,000 endowment in her name. The endowment benefits participants in the Texas State International Piano Festival, directed by Dr. Jason Kwak and set for June 3-11 at the Performing Arts Center. This entry was posted in alumni students faculty NEWS and tagged betty dickinson, piano festival, tilden on May 24, 2017 by Thomas S. Clark. The open-access student computer lab in the Music Building, directed by Hank Hehmsoth, has received a Texas State grant of $45,000 to upgrade equipment. All 24 workstations will get new, faster computers and continue to offer specialized music software for student use in music course work and creative projects. This entry was posted in alumni students faculty NEWS and tagged music computer lab on May 23, 2017 by Thomas S. Clark. The Hill Country Youth Chorus, directed by Lynn Brinckmeyer, completed their 2016-1017 concert season the first week of May. Singers in the choir represent approximately 10 different schools each year. 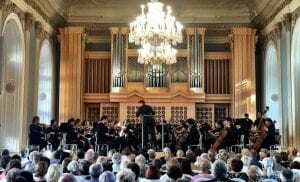 When the choir started in 2005 they established the tradition of “charging” an admission fee for their spring concert. The “fee” is a bag or box of non perishable food for the San Marcos Foodbank. Singers and their family members have contributed 1,300+ pounds of food to the San Marcos Foodbank since 2005. This entry was posted in alumni students faculty NEWS and tagged foodbank, hill country, youth chorus on May 8, 2017 by Thomas S. Clark. Michael Martinez will attend the Eastman School of Music with an assistantship and will be the 1st trombonist accepted into the DMA program in four years. Michael Johnson will enter the DMA program at the University of Alabama and will be the teaching assistant for the trombone studio and theory department. Matthew Flores will attend Ithaca College with an assistantship and study with Texas State alumnus Dr. Hal Reynolds. Camden Scarborough will enter graduate study at Northwestern University in the fall. This entry was posted in alumni students faculty NEWS on May 5, 2017 by Thomas S. Clark. Michael Martinez was accepted into the Pacific Region International Summer Music Academy in Canada in addition to the Hawaii Performing Arts Festival. Michael Johnson was accepted into the Southeast Trombone Symposium’s Participant Class. Camden Scarborough was accepted into the Collegium Musicum Schloss Pommersfelden International Summer Academy. Ramiro Cortez was accepted into the Collegium Musicum Schloss Pommersfelden International Summer Academy and the Eastern Music Festival. Joseph Raby was accepted into the Pokorny Low Brass Seminar at the University of the Redlands and the Alessi Seminar at the University of Oregon. Gabriella Santana Lamboy was accepted into the Summer Trombone Workshop at the Manhattan School of Music. Matthew Acosta was accepted into the Southeast Trombone Symposium’s Participant Class. This entry was posted in alumni students faculty NEWS on May 4, 2017 by Thomas S. Clark.